In mid-2010, after a few solid months under my belt running Eyebeam’s prestigious residency program way out in West Chelsea, Michael Mandiberg said to me that what he loves about Eyebeam is that it’s the only organization he knows that is “constantly becoming.” This connected — I realized that one of the things I loved about it was exactly that quality: it changes at the speed of invention, firmly footed in the present but with a periscope that peers deeply into the future of what could be. One day, Michael would be lasercutting books that ultimately settled into his widely acclaimed exhibition From Aaaaa! to ZZZap! at Denny Gallery, NYC, and the next Ayah Bdeir would be organizing the Open Hardware Summit, the first-of-its-kind gathering in the United States that helped cement the open hardware standard. At that time, as green as I was, I thought this was just another day on the job. Now I can see how magical it is that this happens at Eyebeam nearly every day. Yesterday, during exit interviews with our current group of residents, I was reminded of this magic when Morehshin Allahyari was recounting the effect on the growth of her practice from having a year of protected space for experimentation, the great community reception she got to her event Re-figuring, and how the conversations and critiques with Eyebeam alumni and the others in her residency group radically and positively altered her trajectory. These stories reaffirm the Eyebeam formula: two parts freedom to work on what you want, one part critical dialogue, and one part play. Seven years later, we’re about to enter a new chapter — around the office we’re calling it “Eyebeam 3.0.” This new chapter is extremely exciting because our new space in Bushwick allows us to be public in whole new ways, to double down on our core values of openness, invention and justice. We see this new home as an opportunity to continue to “fund the unfundable” by nurturing projects that are on the horizon of what is possible — then share them locally (and globally) through presentations, workshops, online initiatives, and inventive programs that move beyond the typical exhibition. We can do this better because we will have a dedicated storefront space that will house both the residency work areas as well as act as a public space for events. We imagine it to be a very active space with regular panels and discussions, as well as presentations by residents and alumni — a group of the most exciting thinkers and makers in the world. I believe Eyebeam is at its best when it is oscillating: between process and engagement, between present and future, through the most visionary work of artists and technologists coming together with the community. Essentially, we envision the new space to do just that, to be an idea space where people can use art to deeply explore technology and society as well as dream up new horizons of possibility. We will also have dedicated learning space: Eyebeam’s education program is one of its treasures, and we aim to bring to the fore our singular approach to artist-led learning through public workshops and the long-running student residency program for teens. The space will be a power station for invention and thought, from both the Eyebeam community as well as for curators and organizers who may want to try out new ideas outside of traditional presentation or museum models. And of course, we will maintain our focus on dedicated and generous support to artists and engineers who are critically engaging with technology as well as people who are inventing new projects towards a better future. This singular approach continues to be vital and our new space will provide a crucial and accessible hub in New York for all who are curious, in a spirit of openness and dialogue. Eyebeam will launch the new space with the techiest art party of the season on November 30th, add it to your calendar now. Public programs will begin in full in Spring 2018. 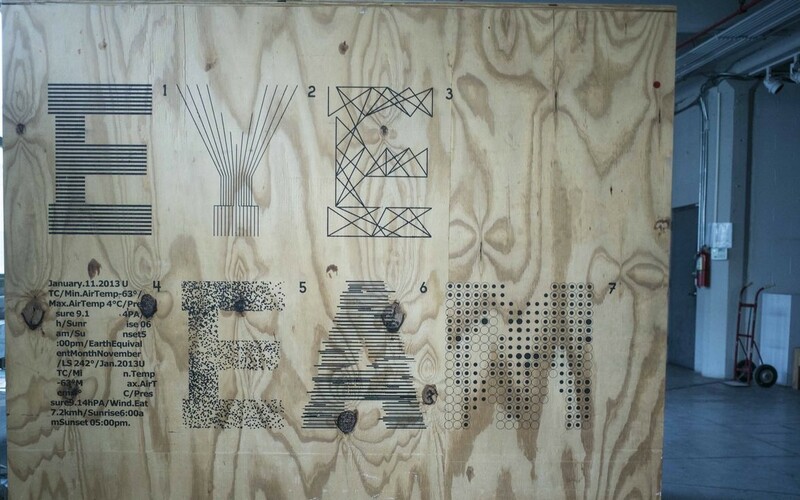 Eyebeam is a nonprofit studio for collaborative experiments with technology toward a more imaginative and just world.